Getting used to wearing your new braces can be hard at first. You’ll likely feel some soreness once they’re on, but luckily that’s only temporary; as time goes on you’ll become more used to them. Once you finish treatment, you’ll have a brand new, healthier smile for many years to come. 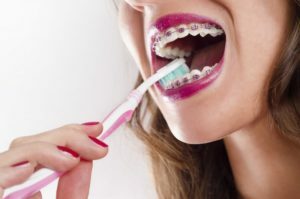 Since much of your teeth remains covered, your orthodontist in Parsippany wanted to give you some tips on how to effectively keep your teeth clean while wearing braces. There are also certain foods you’ll need to watch for. By the time you’re done reading this post, you’ll be far better equipped to take care of your future smile. After you remove any elastics from your mouth, start by cleaning around the wires and pins. Then, focus on the wire, brushing from top to bottom all the way around each arch. Once you’ve removed food debris from the hardware, start focusing more on your teeth. You’ll need to brush for at least two minutes to remove plaque effectively. Finally, rinse out your mouth and examine your braces in the mirror. Check for any food particles before you start flossing. To make brushing easier, consider getting an electric toothbrush with a rotating head. There are a few ways you can address flossing with braces. If you’re using traditional floss, make sure that it’s waxed so it doesn’t tear as easily. Alternatively, you can purchase an orthodontic floss threader which specially allows you to pull floss through the teeth above the wire, reaching the gum line. Start by carefully threading the floss under the main wire before passing it in between your teeth. Then, remove the thread from out the wire before moving to the next two teeth. Avoid snapping the floss, just gently move it up and down against the side of reach tooth. Removing plaque on the sides of teeth isn’t as difficult once you’ve already brushed. Foods that are hard, crunchy, sticky, and tough should be avoided while wearing braces. These can easily get caught and even damage the hardware that’s so essential to your treatment. Also make sure to avoid chewing on inedible items like pen caps, pencils, and your nails. The key is to get acquainted with foods that won’t get easily caught in your hardware. Make sure your family helps to accommodate your new braces by cooking some of your favorite braces-friendly meals. If you have more questions, schedule an appointment with your orthodontist in Parsippany today! Dr. Alan Rauchberg recommends that you visit him every 6 months for exams and cleanings on your braces in Parsippany. He may also recommend visits every 3 months to make adjustments to your braces as needed. To learn more about caring for your braces or to learn more about the practice, contact him at (973) 718-9887 or visit his website.